The EnterpriseDesktopAppManagement configuration service provider is used to handle enterprise desktop application management tasks, such as querying installed enterprise applications, installing applications, or removing applications. Application installations can take some time to complete, hence they are done asynchronously. When the Exec command is completed, the client can send a generic alert to the management server with a status, whether it's a failure or success. For a SyncML example, see Alert example. The following diagram shows the EnterpriseDesktopAppManagement CSP in tree format. ./Device/Vendor/MSFT/EnterpriseDesktopAppManagement The root node for the EnterpriseDesktopAppManagement configuration service provider. MSI Node for all settings. MSI/ProductID The MSI product code for the application. MSI/ProductID/Version Version number. Value type is string. Supported operation is Get. MSI/ProductID/Name Name of the application. Value type is string. Supported operation is Get. MSI/ProductID/Publisher Publisher of application. Value type is string. Supported operation is Get. MSI/ProductID/InstallPath Installation path of the application. Value type is string. Supported operation is Get. MSI/ProductID/InstallDate Installation date of the application. Value type is string. Supported operation is Get. MSI/ProductID/DownloadInstall Executes the download and installation of the application. Value type is string. Supported operations are Execute and Get. In Windows 10, version 1703 service release, a new tag <DownloadFromAad> was added to the <Enforcement> section of the XML. The default value is 0 (do not send token). This tag is optional and needs to be set to 1 in case the server wants the download URL to get the AADUserToken. MSI/ProductID/Status Status of the application. Value type is string. Supported operation is Get. MSI/ProductID/LastError The last error code during the application installation process. This is typically stored as an HRESULT format. Depending on what was occurring when the error happened, this could be the result of executing MSIExec.exe or the error result from an API that failed. MSI/ProductID/LastErrorDesc Contains the last error code description. The LastErrorDesc value is looked up for the matching LastError value. Sometimes there is no LastErrorDesc returned. MSI/UpgradeCode Added in the March service release of Windows 10, version 1607. MSI/UpgradeCode/Guid Added in the March service release of Windows 10, version 1607. A gateway (or device management server) uses this method to detect matching upgrade MSI product when a Admin wants to update an existing MSI app. If the same upgrade product is installed, then the update is allowed. Get Operation being performed. The Get operation is a request to return information. CmdID Input value used to reference the request. Responses will include this value which can be used to match request and response. LocURI Path to Win32 CSP command processor. Delete Operation being performed. The Delete operation is a request to delete the CSP node that represents the specified MSI installed application and to perform and uninstall of the application as part of the process. LocURI Path to Win32 CSP command processor, including the Product ID (in this example, 1803A630-3C38-4D2B-9B9A-0CB37243539C) property escaped for XML formatting. Get Operation being performed. The Get operation is a request to report the status of the specified MSI installed application. SyncML to perform MSI install operations for an application targeted to a specific user on the device. The Add command is required to preceed the Exec command. Add This is required to precede the Exec command. CmdID - Input value used to reference the request. Reponses includes this value, which can be use to match the request and response. LocURI - Path to Win32 CSP command processor, including the Product ID (in this example, 1803A630-3C38-4D2B-9B9A-0CB37243539C) property escaped for XML formatting. Exec The Exec node includes the parameters and properties requires to locate, download, validate and perform product installation. CmdID - Input value used to reference the request. Responses will include this value which can be used to match request and response. MsiInstallJob - Contains all information required for the successful download, validation and execution of the MSI installation process (see section at the end of this document for details on this embedded data object). Note Information status on the MSI job will be reported using standard OMA-DM notification mechanism. The status reported is represented using standard MSIEXEC return codes as HRESULT as defined in the MSIEXEC topic on Microsoft TechNet at https://technet.microsoft.com/library/cc759262(v=ws.10).aspx. The following table MsiInstallJob describes the schema elements. Download child element of Product. Container for download configuration information. ContentURLList child element of Download. Contains list of 1 or more content download URL locators in the form of ContentURL elements. ContentURL Location content should be downloaded from. Must be a property formatted URL that points to the .MSI file. Timeout Amount of time, in minutes that the installation process can run before the installer considers the installation may have failed and no longer monitors the installation operation. RetryCount The number of times the download and installation operation will be retried before the installation will be marked as failed. RetryInterval Amount of time, in minutes between retry operations. The following tables shows how app targeting and MSI package type (per-user, per machine, or dual mode) are installed in the client. 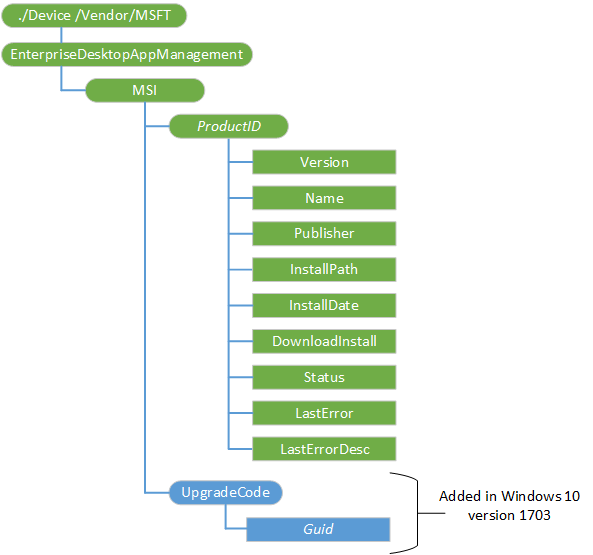 For Intune standalone environment, the MSI package will determine the MSI execution context. The following table applies to SCCM hybrid environment. Properties can be specified in the package, passed through the command line, modified by a transform, or (more commonly) selected through a user interface dialog.